The title of this choir's latest concert derives from Will Shakespeare, and what this group has done is collected and sang songs from composers from Shakespeare's time (or earlier) to the present. The group appropriately calls itself "intima" because of they like presenting in a somewhat intimate and casual atmosphere. The altar area of St. Philip's Church was converted into a living room where the singers, dressed in semi-formal or casual attire, would laugh and joke around between their songs. A reception followed during intermission where cookies and non-hard drinks were served for donations, and the choir's CDs were also there for sale. I found their performance quite exquisite and delightful. The only problem was I couldn't hear the narrator as he described the songs the group was about to sing. I think he should have used a mike. It was interesting, though, to hear the different compositions through the ages. For example, there were four different compositions of "O Mistress Mine" from Shakespeare's Twelfth Night (II, 3) with the tune taken from Thomas Morley (1558-1602), a predecessor of the bard. Another composition of the same lyrics was also sung by the choir, this time from Shakespeare's contemporary, Sir Charles Sedley (1639-1701). The other two interpretations were from contemporary composers Gyorgi Orban (b. 1947) and Ana Sokolovic (b.1968), This last one was sung beautifully and passionately by soloist Melanie Adams, to the delight of the audience. What makes this choir unique is their flexibility and versatiity. They sing in groups of sixes, duets, solos, sometimes serious, sometimes comical, and everyone has operatic voices with quite a bit of range. 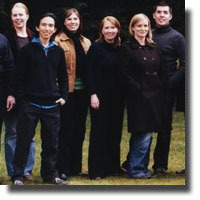 This choir was a nominee for the 2011 Juno Awards, and a first place winner of the local classical vocal ensemble competition. Its next project is a "season soiree" on May 11th. For more info, go to musica intima.